District Assembly: the District Assembly dates are: Sat., 3/29, at Pacifica High School in Oxnard, and Sat., 4/12, Bakersfield College, Bakersfield. Both sessions are from 8 AM to 12:30 PM. New this year is that ALL registration must go through President Betsy Munroe so she can register everyone at one time. This includes members attending the Assemblies as District Staff. Please let her know no later than March 18th if you will be attending one of the Assemblies. There is no cost. Also new this year, an Introduction to PRLS class will be available in Oxnard the morning of 3/29 for those members who have been in Rotary less than one year. A second Intro to PRLS class will be held in the afternoon for those who attended the DA and would like to attend. Dist. Gov. 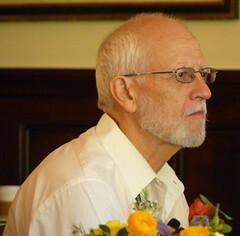 Jack McClenahan’s “Demotion Luncheon” will be held Sat., 6/28, from 11 AM – 2 PM at the Marriott Courtyard in Oxnard. Registration can be done on the District website. Check out the District website for info/registration on all these events at http://www.rotarydistrict5240.org. President Betsy Munroe decided to figure out how many programs the charter members have done. Over their 29 years in Sunrise, it’s approximately 1,334 programs with approximately 2,669 cups of coffee each! Betsy Munroe invited Andrew Chung, Andy Doerr +2, Gary Jensen +4, Steve Kally +3, Darren Doi, and Tom Heath to the podium. Since one of our foci has been on fundraising this year, she felt it was overdo to thank those members who put in a heck of alot of time behind the scenes over the years to put on our golf tournament and Fiddlers’ Festival and Camp Whittier work day. She honored each of them with a Paul Harris Fellow. Andrew and Darren received their first PHFs. ​The bus for the Westlake Women in Rotary party on 3/15 will pick up in Goleta at the Airbus facilities at 4 PM. If anyone needs Carp or Ventura pick-up time/location, let Betsy know. Andy Doerr reminded the club that tomorrow there’s a meeting for the Fiddlers’ Festival, and everyone is invited. The meeting will be at the MTD offices, 550 Olive Street, at 5:30 PM. Bill Boyd invited all members to Elings Park on Saturday, March 22, from 8 AM to noonish. The team will help clean up the area, including weeding and improving the drainage. They may put in a new watering system. Please sign up next week. Steve Kally announced that the Ojai hike was postponed due to closed roads. They’ll find a new date in April. Steve Boehm attended the hike that didn’t happen and enjoyed kayaking and playing Frisbee golf. Getting To Know You with Karen Kawaguchi. If you didn’t have your current career, what career would you do? She would have become a doctor. She even took two years of Latin in high school. Camp Whittier will have a golf tournament on April 25. Joe Weiland is trying to put together a foursome that he won’t be a part of. It may include Fred, Steve K. and Andrew. The tournament will be at Alisal River Course. Who’s interested? Gloria Roman gave an update on her travels. Bill Ringer gave an on-the-spot update from the International Committee. The team is trying to get a Global Grant. They want to return to Nicaragua to work on the clinics. The trip will likely be early September, and club members are invited to go. Mark Reinhardt sent a package of school supplies to Nicaragua. ​Raffle Results: Richard Redmond won. ​Pay & Tell with David Velarde, our Sergeant in Arms. 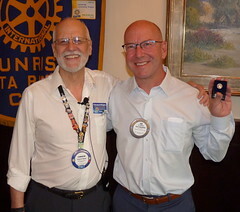 Program:Don Bennett introduced the polio campaign for Sunrise with special guest speaker Bob Putney from the Rotary Club of Cambria. In case you didn’t know, we’re THIS CLOSE to curing polio. Thank you to Bob for getting on the road in the 4 AM hour to come speak with us. 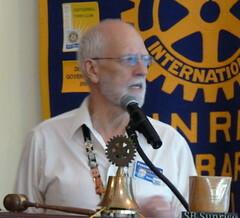 Bob thanked the club members for not losing the vision that started in 1984 with Rotary. Bob participated in an National Immunization Day (NID) in India. In 1987, a 4H grant in Philippines focused on the eradication of polio. At a meeting, people laughed at the idea of eradicating polio globally. But now more and more countries are joining the fight. He dedicates his presentation to two of his district heroes, including Larry Emerich and Jim Louis. Around the world, Rotary is highly respected. His NID team received a standing ovation on an airplane when the captain announced the Rotary passengers. The two drops vaccine is not a magic bullet solution. For many children, for example those with intestinal problems, the vaccine won’t take. Rotarians take extra care to get those children healthy enough to have the vaccine take. There were 100,000 cases when they started. In 1989, the Americas became free of polio, but it remains only one plane ride away. If eradicated, it would be the second disease in the history of the world that’s eradicated. Three years ago, polio was limited to Pakistan, Afghanistan, India and Nigeria (PAIN). As of this year, India is polio-free — no new cases. Now it’s NAP — Nigeria, Afghanistan, Pakistan. In Afghanistan, there have been more than 150 cease fires due to deals brokered by Rotarians so that they could get into villages in rural countries and vaccinate the children. Where polio remains, it’s very difficult to get to. And since the vaccination has to stay cold, it’s extra challenging. Sometimes travel is 40 hours without electricity. Bill Gates’ father was a Rotarian. He has helped develop technology that uses solar power to keep the vaccine cold. Type 1 and type 3 polio are the two remaining. Who else is involved? Unicef, CDC, World Health Organization. United Nations. There are 0 cases of polio in Afghanistan for 2014 so far. The nomadic nature of people in Nigeria contributes to the challenge of immunizing children. Corruption in both Pakistan and Nigeria add to the problem. The Syrian government has stopped immunizing people for anything for about 5 years. It’s possible there’s a young girl infected with polio in Syria now. It’s unconfirmed. They can now test people who have polio and find out where it came from. For example, last year’s Somalia infections came from Pakistan. On his NID, he and his fellow Rotarians were viewed as heroes. The current goal is to have it eradicated by 2018, and we’re on course despite a few detours. Bill Gates and Melinda Gates will match 2 for 1 to your donations up to $35 million/year. Global Polio Eradication Initiative is now a model for other diseases, like dengue fever and malaria. We learned a lot in this effort that can be applied to other efforts. Our campaign was kicked off with 6 people who donated $5,000, including Betsy Munroe, Judith McCaffrey, Eric Ryan, Luz Maria Ortiz and E. Russell Smith and Don Bennett. Consider yourself asked to also donate $1,000. Our goal is $12,000 for our club. He asks us to consider making a stretch pledge before the end of the Rotary year — June 30. If you turn in your pledge card today, there will be a drawing next week with a prize for a woman and a man. As a token of our appreciation to the speakers, the club will donate 15 dictionaries to local 3rd graders in your honor.